Here’s the shawlette so far–it’s a good traveling project because it’s easy and portable. In other news, I saw I Love You, Man, which I kept calling P.S. I Love You, Man, and it was hilarious. I highly recommend it. I think my friend was sort of horrified that I laughed through the whole thing–I think at one point she was laughing at me laughing at the movie, but I genuinely found it funny. Also, I love Rashida Jones. She is the cutest. This post is going to be short because I’m off to see Duplicity. I’ve been doing a little freelance work and hanging out with my family–but I’m hoping to have more blog posts this week. I love the look of that shawl. Me too, it’s on my wish list. 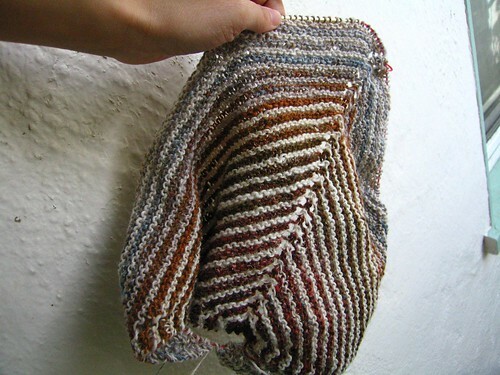 So far I am resisting the temptation to buy more Noro. really rich colors in your shawlette – it’s going to go with everything. i hope Duplicity was good – i’m going to go tonight.